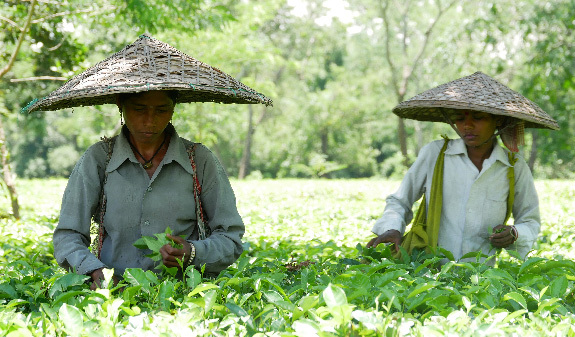 Assam produces around 80% of all of India’s tea so is an important state for the country since Indians drink a high proportion of their harvest - as much as 80% of the country’s entire production! The state is the most north easterly region of the country and borders China, Bangladesh and Myanmar. The Jalinga tea garden is situated in lower Assam and is around 25 miles south of the city of Silchar. As is the norm for all of Assam’s tea gardens, the altitude of Jalinga is low, standing at only around 100 MASL. The garden is incredibly beautiful with the tea growing upon undulating hills with a good amount of shade trees in all areas. It is a big garden covering some 1,100 hectares, 650 of which are under tea. 225 hectares are left untouched as natural forest. The tea produced by Jalinga is entirely organic. These certifications are all excellent and point to a desire from the owners to run their business sustainably with strong focus on both environmental and social standards but it is undoubtedly the carbon neutral certification that stands out as their greatest achievement. Achieving this means that Jalinga is the only carbon neutral certified tea farm in the world! It has been achieved by protecting the forest on the land, by farming using only organic practises, intense composting of organic waste such as pruning matter and cow dung, and by issuing eco stoves to each family who live and work in the garden. With 1,600 employees, this accounts for a lot of stoves but they have reduced fuel usage by 60% and better still, left over charcoal is collected and utilised by the factory for firing their tea. This reduces the amount of coal they are currently using for this process and has helped push the farm to being carbon neutral. 8% experimental speciality teas such as white, green and oolong. Camelia Sinensis of the varieties DV23, 25 and 26 are grown around the garden. There is a plan to replace old trees with plants from seed rather than cloned cuttings since they are genetically stronger and produce better quality leaf, require less maintenance and have greater longevity (lasting 60 years as opposed to 45 years for cloned plants). Jalinga produces its own seed and we saw both seeded and clonal plants in the garden’s nursery. Though the vast majority of tea produced on Jalinga is CTC, we are more concerned with their orthodox production since that is the tea that we buy. We had noticed that the pluckers were picking more than two leaves and a bud and we were informed that this is for the CTC production (and therefore likely to find its way into paper teabags). Much greater care is given to the collection of orthodox leaf with specially trained pluckers, of which there are about 100, only selecting the top two leaves and buds from a designated area where the leaf (from seeded plants, not clonal) is fragrant and of high quality. This leaf is delivered to the factory where it is withered for between 14 to 18 hours to achieve a moisture content of 60%. This differs to CTC which is withered to 72% moisture over 12 to 16 hours. After the withering process orthodox tea is sent to the rolling table (rather than the CTC shredder) where the leaves are rolled and twisted with the intention of keeping them as whole as possible. Next the leaves are oxidised for around 2 hours and 20 minutes - a longer period than the 1 hour and 20 minutes for CTC but this is due to the larger size of the leaf. Next, the oxidised leaves are fired in 3 stage dryers which involves passing the leaves through 3 different ranges of temperatures that fall between 120F to 180F). This takes around 25 minutes. Finally, the tea is sent to the grading room where sieves are used to separate the various sizes of dried black leaf. Grades include TGFOP (tippy, golden, flowery orange pekoe) and GBOP (Golden broken orange pekoe). It was reassuring to learn how much care is taken over the production of the orthodox leaf that we buy for Storm’s Organic Breakfast Blend. The contrast between this tea and the leaves selected and processed for paper teabags was like chalk and cheese! Harvesting on Jalinga takes place between March and December. The first flush occurs during March and April and the second flush from June to August. Plucking continues until December during what are known as the Monsoon and Autumn flushes. A yearly bonus that is paid in September as a one-off payment. A hospital for the use of all employees. Gardens with each house so that the family can grow vegetables and rear animals. Most families had several cows and chickens. We visited a home that was basic inside and out – brick with corrugated iron rooves. It had two bedrooms, electricity, two eco stoves and this family had 3 cows and some chickens (as did the immediate neighbours). It is a simple way of life and difficult for outsiders to judge. My personal gut-feel is that the people of Jalinga are looked after and seem to be happy. It is sobering to consider the life of the Jalinga worker when we compare it to our own but my overall impression of this tea garden is that it is run by owners and management that care deeply about the environment and their workers and this is demonstrated by the certifications they have achieved and the practices we observed. The tea we buy is good quality and brings a tremendous rich and malty character to our organic breakfast blend. The Storm Tea ethos - We care about flavour, tea farmers and their staff, the environment and our well-being) are all covered off at Jalinga. This is a good garden for us to source from.